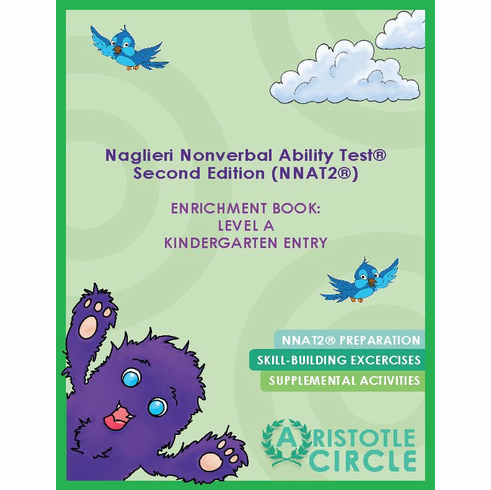 This Naglieri Nonverbal Abilities Test® - Second Edition (NNAT2®) Enrichment Book: Level A Kindergarten Entry helps parents understand the content on the test, as well as provides ample practice questions to help prepare children for the exam. The NNAT2® Enrichment Book includes stretch questions that cover Levels B and C. This book comes with a free copy of the Naglieri Nonverbal Abilities Test® - 2nd Edition (NNAT)® Practice Test 1: Level A Kindergarten Entry. 40 monster stickers to encourage persistence and promote learning through play. As seen on ABC News! OLSAT® Test Preparation Workbook Now Available! Look here for our free NNAT video tutorials! Save with our multi-test bundles! We also offer the OLSAT® A Test Prep Workbook and OLSAT® A Practice Test 1, which is included with the purchase of the OLSAT® A Test Prep Workbook or may be purchased separately. For private school admissions, we offer our best-selling and most-highly recommended ERB test preparation workbook. The NNAT2® is a culturally-neutral, nonverbal measure of reasoning and problem solving abilities. This test does not require English language skills or mathematics; it contains problems that primarily use geometric shapes and pictures.